Every time I see a recipe that uses dill, I tell myself I should use it more often, and then I don’t. But this time I did! These creamy dill and caper lentils make a really quick and easy dinner with tons of that lovely fresh, zesty flavour. Plus, I served mine topped with grilled halloumi, which instantly makes anything a winner. I don’t know about other parts of the world, but in the UK I find it really hard to find dried puy lentils in the supermarkets. I suppose I could have used a different kind of lentil instead, but personally I think puy lentils have the nicest texture and the richest flavour, so instead I used a sachet of pre-cooked puy lentils. I love these things – they’re just puy lentils boiled up with a bay leaf and some onion. You could easily cook your lentils from scratch if you prefer, or if you can’t get your hands on the sachets. I do love how easy the pre-cooked lentils are to use though – just pop them in the microwave or empty them into a frying pan to heat through. My little cheat also helps to make this recipe a super quick 15 minute lunch or dinner. I’ve been exhausted lately (I really appreciate you guys sticking with me through my somewhat intermittent posting here! ), and although I don’t feel like I’m working any less hard than usual, I just can’t bring myself to cook anything complex – so 15 minute meals are just what I need. Pasta is an obvious solution, but it’s nice to have some alternatives to choose from too. I’m a big, big fan of a 15 minute dinner. I simply cooked the puy lentils with some onion, fresh dill, capers and lemon juice to give that lovely fresh flavour. To make them creamy, I added a dollop of mascarpone cheese that I had leftover from another recipe – but you could also use creme fraiche, ricotta, or whatever else you have on hand. Then I just topped the lot with a few slices of halloumi that I cooked up in a griddle pan (see here if you’re not sure how to cook halloumi perfectly!). These creamy dill and caper lentils are full of flavour, protein-rich, really quick and easy to make, and topped with halloumi –> perfect in every way. Heat the oil in a frying pan, and add the finely diced onion. Cook for a few minutes over a medium heat, until the onion is soft. Add the cooked puy lentils, chopped dill, lemon juice and chopped capers, and cook for a couple more minutes until the lentils are heated through. Add the mascarpone cheese and plenty of black pepper, and mix to combine. You may also need to add a dash of water if the mixture seems too thick. In a hot griddle pan or frying pan, cook the halloumi for a few minutes each side, until golden brown. Serve the creamy lentils topped with the grilled halloumi. 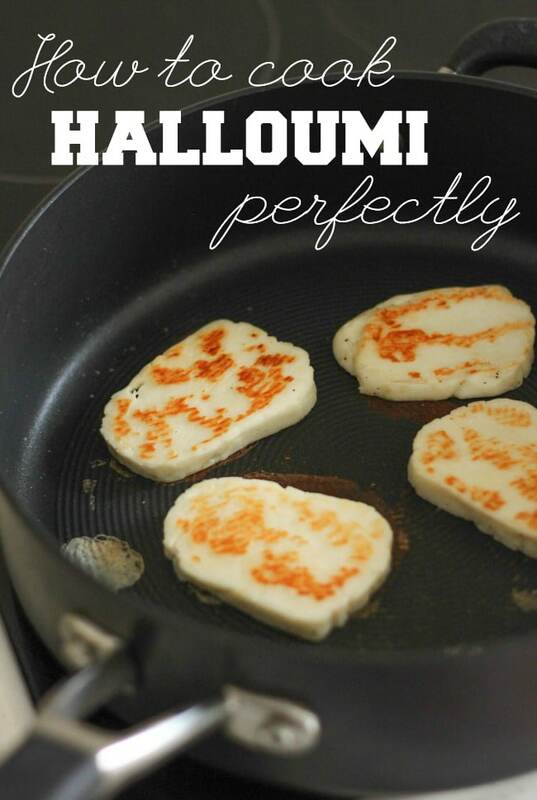 Never sure how to cook halloumi? This is the post for you: How to cook halloumi perfectly. My Romanian grandmother adds dill to everything she cooks so everytime I use it in my kitchen, it reminds me of her. I will definitely try these lentils, since i am always looking for quick meals to do at dinnertime. This looks incredible. Thanks for the tips! I am the same way about dill. I recently planted some with the intention of using it more often. Love the pre-cooked puy lentils you used here for a quick and easy dinner! The flavors you used sound so delicious! And the halloumi is perfect for a change in dinner protein! Such a fabulous dinner to add to our rotation! A very unusual-looking dish but as soon as I saw the halloumi I knew it was right up my street. I mean, you could cover anything with grilled halloumi and it would taste nice! But in reality, I’m interested to find out more about lentils as someone whose been a vegetarian for the past year; I’m finding it easy to do flavoursome veg but more difficult to use pulses and beans as the base for a meal. Will definitely give this a go if I can find the right ingredients! Fresh herbs are oft neglected in 15 minute dinners. Even the photograph benefits from that lovely green dill! I love puy lentils and the pre-cooked ones are always in my pantry for creating quick meals. This looks so delicious – going through a major lentil phase recently! Me too, always got a sachet on hand. So convenient! Love your flavour combinations. I’ve been wondering about pulse-based recipes lately but the ones I’ve found thus far seem to be mostly Indian! Thanks Michelle! I love pulses, especially puy lentils. They’re so versatile.